Just four years after Dmitri Mendeleev published his 1871 periodic table that predicted element 31 and gave it the tentative name eka-aluminum, spectroscopic evidence for the existence of the element was detected in a sphalerite sample by Paul Emile Lecoq de Boisbaudran. Lecoq later went on to discover more elements, but he named gallium, his first, from the Latin for Gaul, the area occupied by his native France. For the following eighty-five years, it was primarily a curiosity--a metal that is solid around room temperature, but liquefies when held in the hand--but did find some use in the preparation of metal alloys with special properties such as low-melting points, in high-temperature thermometers, and as the reflective compound in mirrors. Gallium use changed forever in the 1960’s, when gallium arsenide was developed as a semiconductor with somewhat different electrical properties than the more common silicon, and that is more suited than silicon to some applications. Notably, gallium arsenide is a direct band gap semiconductor, which means that it can both absorb and emit light with high efficiency. This lends it to use in LEDs and lasers. Additionally, extremely thin layers of gallium arsenide can effectively absorb all the photons from incident sunlight, as opposed to the thick layers of silicon required for the same task. This allows for the creation of one type of thin-film solar cell. Gallium arsenide semiconductor devices also exhibit less noise than those produced from silicon, and are thus favored in many telecommunications applications. In addition to being a component of gallium arsenide, gallium can be used to make several other semiconducting compounds. The gallium semiconductors are used in many applications, including light-emitting devices such as LEDs and lasers, photovoltaic and thermophotovoltaic cells, and integrated circuits. Gallium also finds use in a few highly specialized technical applications, including in neutrino-detecting telescopes, notable for the sheer volume of gallium they can require--the Gallium-Germanium Neutrino Telescope used by the SAGE experiment at the Baksan Neutrino Observatory in Russia used at least 55 tons of the liquid metal. It can also serve as a liquid metal ion source for focused ion devices. Gadolinium gallium garnets are used to fabricate optical components and as a substrate material for magneto-optical films and high-temperature superconductors. Finally, gallium phosphate is a piezoelectric material that can function at high temperatures unlike alternatives such as quartz, which makes it useful for pressure and force sensors in high-temperature applications. Gallium is not a compound naturally involved in human biology, but because it is generally considered non-toxic at low doses and mimics some of the properties of iron in the body, it is useful in some medical applications. Gallium tends to concentrate in areas of high levels of inflammation and cell growth, and therefore radioactive isotopes of the element are used in scans for tracking the spread of some cancers and disorders of the immune system. Additionally, gallium salts are used to treat hypercalcemia that results from cancers metastasizing to the bones, and are under investigation as treatment for certain types of cancers. Gallium compounds are also known to be toxic to some disease-causing microorganisms, and organometallic gallium compounds have shown some promise as potential malaria treatments. The few minerals which contain substantial percentages of gallium are too rare to serve as a commercially viable source of the element. Gallium is found in small amounts in the aluminum ore bauxite and the zinc ore sphalerite, and is therefore extracted from waste materials from the processing of these metals. Gallium has received much attention in relation to its application in the production of semiconducting compounds. Of these, the most important are the compounds of gallium with antimony, arsenic or phosphor. Gallium arsenide (GaAs) is used in the production of diodes and transistors for voltage rectification and signal amplification. Other gallium arsenide applications include semiconductor "lasing" and microwave generation. Gallium is also used in sensors to measure temperature, light or magnetic field. Elemental or metallic forms of gallium include pellets for evaporation source material purposes. Gallium oxide is available in forms including powders and dense pellets for use as optical coating and thin film applications.Oxides tend to be insoluble. Gallium fluoride is another insoluble form for uses in which oxygen is undesirable such as metallurgy, chemical and physical vapor deposition and in some optical coatings. Gallium is available in soluble forms including chlorides, nitrates and acetates. These compounds can be manufactured as solutions at specified stoichiometries. Gallium is a Block P, Group 13, Period 4 element. The number of electrons in each of Gallium's shells is 2, 8, 18, 3 and its electron configuration is [Ar] 3d10 4s2 4p1. The gallium atom has a radius of 122.1.pm and it's Van der Waals radius is 187.pm. In its elemental form, CAS 7440-55-3, gallium has a silvery appearance. Gallium is one of three elements that occur naturally as a liquid at room temperature. The other two are mercury and cesium. Gallium does not exist by itself in nature and is sourced commercially from bauxite and sphalerite. Gallium was first discovered by Hans Christian Oersted in 1825. The element name originates from the Latin word 'Gallia', the old name of France and the word 'Gallus' meaning rooster. Gallium information, including technical data, safety data, high purity properties, and other useful facts are discussed below. Scientific facts such as the atomic structure, ionization energy, abundance on earth, conductivity and thermal properties are also included. Gallium is not toxic in its elemental form; however, safety data for Gallium metal, nanoparticles and its compounds can vary widely depending on the form. For potential hazard information, toxicity, and road, sea and air transportation limitations, such as DOT Hazard Class, DOT Number, EU Number, NFPA Health rating and RTECS Class, please see the specific Gallium material or compound referenced in the “Gallium Products” tab. Met. Corr.1 H290 May be corrosive to metals. P406 Store in corrosive resistant container with a resistant inner liner. Do not store together with oxidizing and acidic materials. Product is not corrosive to the skin. Product is not corrosive to the eyes. 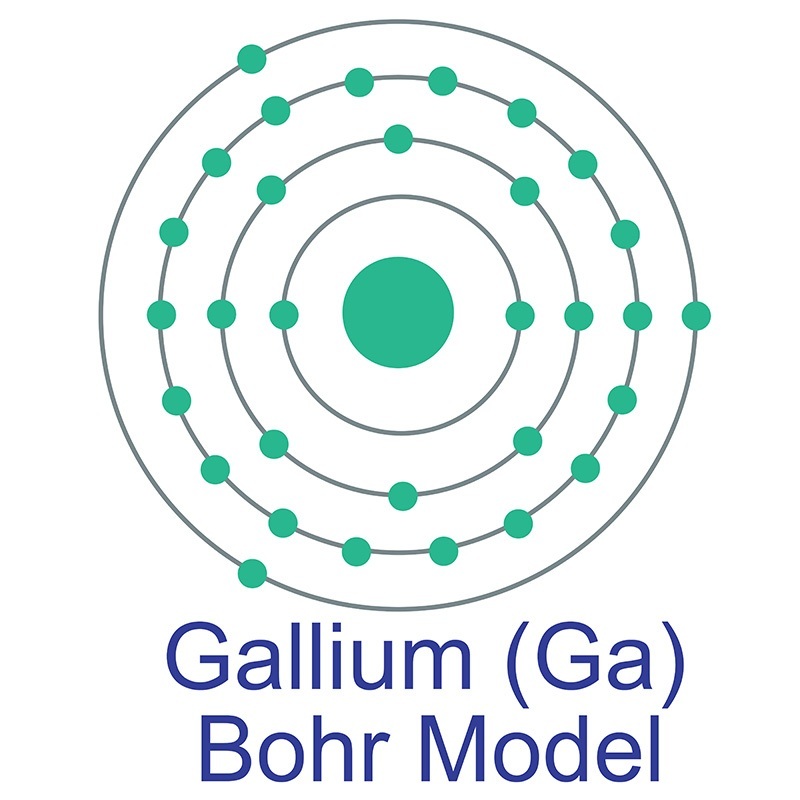 Gallium (Ga) has two stable isotopes: gallium-69 and gallium-71.